Like anyone, I enjoy listening to music. I never learned to play an instrument and I don’t really have a critical ear for the skills of musicians. But I have friends who are skilled musicians. We can listen to the same song and because of their understanding of music, they appreciate the song on a different level. I may recognize that it is a good song, but there is a lot more going on than I fully understand. 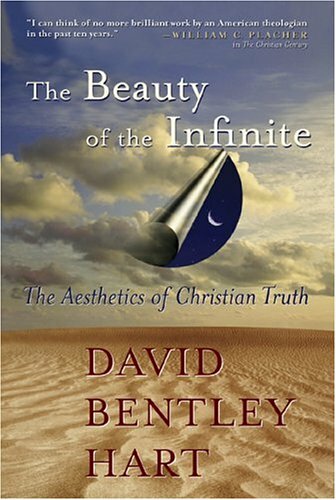 This is how I feel about David Bentley Hart’s amazing book The Beauty of the Infinite. It is like a classic symphony played by a full orchestra. I hear the music and get that something beautiful is happening, but I also know there is a lot more going on that I don’t fully understand. Hart’s book engages with everything from 20th century philosophy to the early church fathers; he has a command of an incredibly wide breadth of writings. The first 150 pages when he discusses the philosophies of people like Deleuze, Foucault, Levinas and others…well it made me wish I had taken more philosophy courses in college. There were moments I wanted to give up. There were numerous words I underlined simply because I had never seen them before (and I wonder if Hart just invented some of them, honestly). Once he began talking about Nietszche and then after that theology, I understood more what he was talking about. Even here though, the writing stretched me. This is advanced philosophical theology at its best. Just as there is nothing wrong with a fun three-minute country diddy, so there is nothing wrong with an easy-t0-read and understand theology book. At the same time, there is great worth in stretching yourself, whether it be the classical symphony or the lengthy philosophical theology. So what is Hart’s primary point? What’s the book about? Postmodern philosophies, really the ideas that have permeated our culture, see all difference as violence. There is an inherent violence that happens when one encounters the other. Christian theology, Hart argues, presents a different story. This story, rooted in the Trinity, is one that allows difference for in the Trinity we see difference and diversity without any sort of violence or confusion. As he continues to show how this plays out through Creation, Salvation and Eschatology…I’ll just say it is one of those books that makes me want to be a Christian. Another point I appreciated is Hart’s urging for Christians to focus on announcing the Christian story. Nietzsche was correct, to some degree, as he criticized Christianity and put forth an alternative approach to the world (the will to power). The choice is clear: power over the other, a power rooted in violence where the strong survive, or peace with the other through Christ. The best thing Christians can do is live out, literally illustrate, this alternative to the will to power idea. I am sure there is much more there. This book will need a re-read sooner rather than later. For those who want a theological feast, this is the book for you.